Friday Creek Retreat, is the perfect blank canvas venue for an outdoor destination wedding and reception. A 100 acre luxury retreat nestled in the rolling hills of the Orara Valley 15 minutes west of Coffs Harbour. 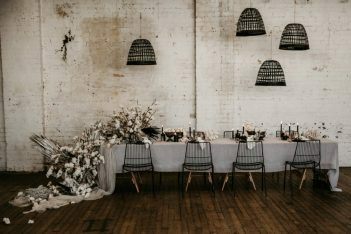 We provide the space, so you can let your creativity run wild by choosing your favourite vendors, styling, props hire, catering, and libations. We want this day to reflect your personality, so we leave the coordination details up to you. Our exclusive-use wedding package includes accommodation for up to 40 of your closest friends and relatives for 2 nights. With nine self-contained cottages, luxurious furnishings, vineyard, tennis court, resort style pool and amenities, your wedding will be a holiday getaway for your guests. Since you’ll have use of the entire property, privacy is assured. Your ceremony and photo-shoots can be held anywhere your hearts desire. 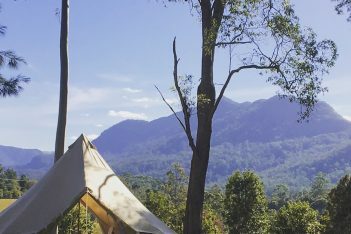 From the lily-adorned lake, romantic island, centuries old eucalyptus stands, flowing creek or overlooking the gorgeous valley from the Bedouin stretch tent on our pool deck. For your unforgettable outdoor reception, choose your favourite vendors or go DIY with all the details. We provide the stunning backdrop of manicured gardens, magnificent valley views and country charm. Choose between an intimate reception on our resort style pool deck equipped with an elegant Bedouin stretch tent BBQ facilities, kitchen, toilets and space for ‘bring your own’ bar or catering hire options. 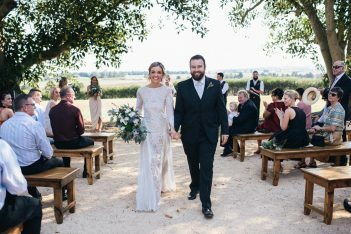 Or choose one of our packages on the lawn for larger wedding parties, with the flexibility to hire your own marquee and make your unique vision come to life. Go to our website for this year’s Wedding Brochure. Get to know our venue on our Instagram and Facebook pages. Or contact Judy and Stuart to arrange a tour.